People consume protein shakes for various reasons. The common scope of use of these products is to replace a full meal. They are also taken as supplement to a diet for losing weight purposes. Since the MR shakes are designed for regular use, it is quite important to choose a high quality product. It should be noted that high price of a meal replacement does not always guarantee top quality. The best MR shake is characterized with the natural ingredients, lack of GMO, sufficient amount of protein and energy value, as well as good properties of texture and taste. 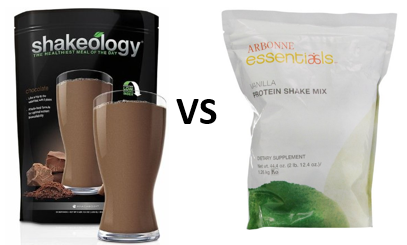 To narrow your search for the appropriate shake, the following review of Arbonne vs Shakeology shakes is introduced. Arbonne Shake contains around 40 ingredients. This product supplies 22 minerals and vitamins to your body. The components of special concern are cornstarch and inulin. The protein of Arbonne meal replacement is plant based. The protein sources include rice, cranberry, and pea. This type of protein makes this product popular among vegan customers, however, the plant protein is known to provide not all essential amino acids. Nevertheless, the protein content in one servings is 20 grams. The other essential nutritional data include 160 calories, 9g of sugar, 3g of fat, and 2g of fiber. The content of Shakeology includes more than 50 ingredients. The shake does not contain any GMO components. The protein in this supplement is also represented with several sources of plant protein (sacha inchi, flax, chia, quinoa, and pea) plus whey protein isolate. The plant-based protein sources lack in amino acids, hence whey protein is added to supplement this essential component. Nevertheless, it is difficult to evaluate the overall quality of protein because the share of each protein source is unknown. One dosage of Shakeology contains 17 grams of protein, 2g of fat, 6g of sugar, and 6g of fiber. The energy value of each serving is 160 calories. In general, Shakeology is safe product. However, such ingredients as spirulina and xanthan gum can cause unwanted effects like diarrhea, bloating, gas and stomach pain. It should be emphasized that the sugar source of this meal replacement can also be harmful. Despite the above, the main customers’ complaint about Shakeology relates to its price. A package for 30 servings is available for $129.95. The price is really huge considering the quality of ingredients of this shake. Besides, the recommended daily dosage of Shakeology is two servings. In this case, a month supply of the meal replacement will cost twofold. The price of Arbonne Shake is half as much as of Shakeology. So is the quality. The consumers complain about the protein quality. The sugar amount of the shake is also high. Besides, the meal replacement contains several potentially dangerous ingredients. In addition, the product does not show a proper efficiency. In fact, it is a challenge to find any positive feedback on this product.